I know most signs will read "Crochet Makes Me Happy" and that's true for me too but it's the act of crocheting that makes me so happy. It's the feel of the yarn as it glides though my fingers and working the hook while watching the magic happen! 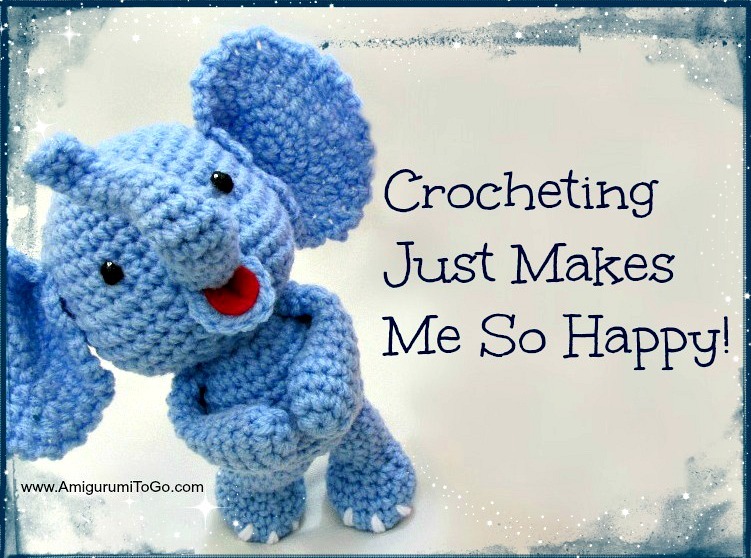 Crocheting makes me so happy, how about you? It's been a while since I've been in school myself so the idea of teaching my own child was scary at first but with all the support we receive the fear is gone! And with that said, my time is a little more limited than it was... of course. But I will do my best to better manage my time so I can still do all the things that I was doing before. So with this spare time I've been crocheting the day away and filming the body parts for the Yarny Monster.. the pattern is already released and I have a "sewing it together" video tutorial for it already and in that video I promised I would do the actual body parts as soon as I could get the time and that is happening right now. Ok the last update is about my facebook page. Yesterday I removed the option to send me private messages through the page. Now that is nobody's fault and no one person caused me to remove that option. Honestly, I have been struggling to keep up with messages as I get many everyday. I have other sites I manage so you can imagine how many messages or comments I can get in a day BUT I truly appreciate them all. I don't find messages a burden at all. It's just a struggle sometimes to find time to answer each one and I hate to have anyone feel ignored! But that's not way you can't message through facebook. The reason why I removed the messaging option is I also had people sending me pattern or video questions to my facebook page which again, was totally fine except for I was having to go find the pattern or video to review whatever the person had a question about and that was taking up a lot of my time. It might seem like an easy thing to do but with over 80 patterns and as many video tutorials it can get a little time consuming. It is always best to leave a question right on the pattern or the video itself with the row number you are referring to. Many people think they can get a hold of me faster via facebook but I schedule posts for facebook days in advance. So even if you see me post an update there it could very well be a scheduled update and I'm nowhere near facebook at the time. You can always leave a comment here on Amigurumi To Go at the bottom of every post and also on my videos on my youtube channel. Here on my blog I moderate the comments to keep this site spam free so if you leave a comment you will not see it until I ok it. It might take me a few days, but I will respond. So again, I love all your comments and pictures so please do keep them coming! I'm off to finish this tutorial. I hope you all have a wonderful yarn filled day. Oh, I almost forgot! If you want to make that elephant pictured above the free pattern is right here. Crocheting really does make me so happy! How about you? What homeschooling program are you using? I've been looking into it andnam overwhelmed by all of the options. Wishing you well on your homeschool adventure!! I have been teaching mine at home for the past 6 years! You're right about having less time to do the things you did before but Ive found that as the boys got used to the routine it freed me up a little for other things. My boys have both learnt to crochet and knit and one of them can also quilt…its amazing how much math is in all those crafts. The best advice I can give you is …relax!! I used to make sure that every hour of every school day was taken up with academic pursuits…..we all got cranky and snappy after a few months. Now I have the absolute basics that must be done every day then I have the "hopefully we'll get to this" work and then I have the "nice to get done today" work. Our family relationships have grown stronger with every passing year and they can easily "keep up" with but mostly surpass their "schooled" friends, although that seems less of a priority now than raising kind, attentive, polite and articulate boys. What a blessing that your mum gets to be part of your sons schooling too! Thank you so much, I sure appreciate the kind words of encouragement. We are Blessed for sure! Thank you for taking the time to comment and let me share a little in your story, it really means a lot to hear this good news.